I was recently asked about what the income and substitution effects are for perfect substitutes are. Given the rather peicewise nature of the demands for each good in a utility function considering perfect substitutes I'm not sure what the answer is. That being said, what are the income and substitution effects for a utility function considering goods that are perfect substitutes? the prices of the goods are equal $\implies$ our budget line is parallel to the IC line and the utility maximization point is anywhere on the budget line. Let's consider the case where good $Y$ is cheaper and becomes relatively more expensive after a price change. 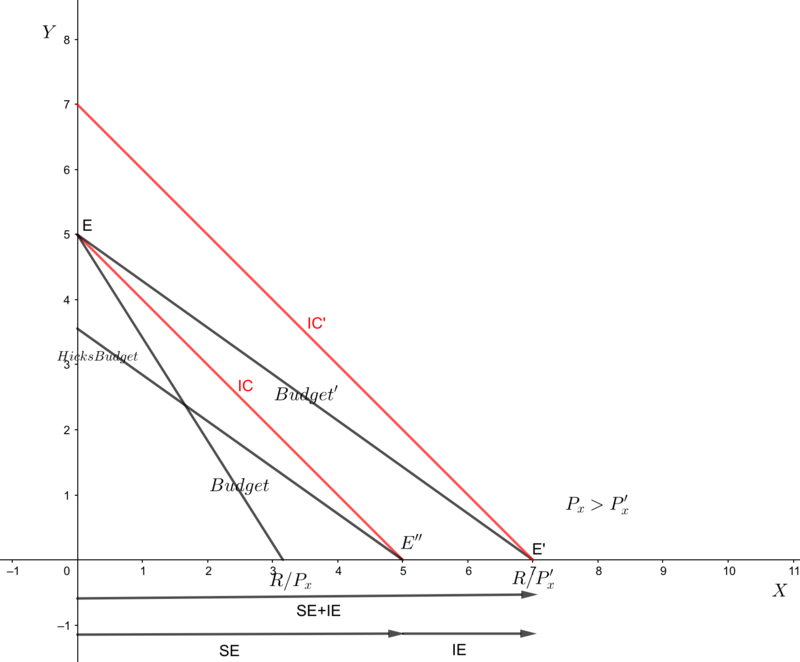 We go from equilibrium $E$ to $E'$ and the equilibrium $E''$ is the one due to a reduced budget by the method of Hicks. For the third case, in theory the original equilibrium can be anywhere on the budget line. In practice it is probably in a fixed position and you can use the same method to derive the IE and the SE. Not the answer you're looking for? Browse other questions tagged microeconomics slutsky-equation or ask your own question. How to determine demand without the price of a good?